I placed my first-ever order from LuckyGunner.com last week. It was a great experience. When I’ve ordered online before, it usually took about 5-7 days for my ammo to show up. Not this time. I placed my order on Wednesday morning, and by 5pm Thusday my ammo was on my doorstep. I thought that the shipping charge was very reasonable as well – $23.59 for 2000 rounds. That’s about half of what I would have paid in local sales tax. I got a great deal on some 9mm and 5.56. With that type of turnaround, I’m about to become a frequent shopper. I’m afraid that the UPS man may start to hate me, though. Posted in DBM. Tagged with ammo, shopping. Posted in DBM. Tagged with Guns, Self Defense, Video. I celebrated National Buy A Gun Day 1 day early. My gun store of choice, Mark’s Outdoors, was closed on Sunday. And could anyone really expect me to wait until Monday to go and pick up this? I’d ordered 2 of them on Wednesday, and got the call on Friday that 1 had arrived. 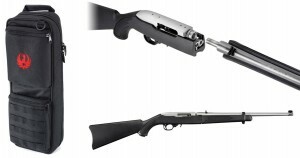 I had swivels installed while the ATF paperwork was processing – For the life of me, I don’t get why Ruger doesn’t ship their synthetic stocks with studs installed. Anyways, I hope to get it out to the range soon! Lots of other cool kids picked up some neat toys too. Posted in DBM. Tagged with BAG Day, Guns, ruger. With all of the political crap going on this day, I’ve heard more than enough talk about what candidates “believe” and how they’re the perfect person for the job. I’ve heard voters talk about what their key issue is. Whether it is the size of the government, fiscal responsibility, abortion, gay rights, gun rights, economic recovery… I would dare say that 99% of voters have an item that is their litmus test. However, I will be using my own method on determining who to vote for: The urine test. It’s very simple. If candidate X were standing before me, on fire, would I bother to piss on them to put out the fire? I’ve only got 1 problem so far: I have yet to see a presidential candidate, from any party, that meets that criteria. Posted in DBM. Tagged with politics. All guns are always loaded! Never let the muzzle cover anything you are not willing to destroy! Always be sure of your target! Even if I was absolutely aware that a gun was unloaded (see rule#1), there is ABSOLUTELY NO WAY IN HELL that I would point that firearm at my wife, son, father, mother, grandmother, aunt, uncle, cat, dog, fish, mailman, or anything else that I wasn’t intending to destroy. Either this rube is incredibly stupid, or there’s a lot more to this story that hasn’t been flushed out yet. Posted in DBM. Tagged with Absurd, Guns, outrage, Stupidity. So last week, after I posted about Oleg Volk’s KSG Surprise, I received a comment from a gentleman named Derek, who listed his URL as KelTecWeapons.com. 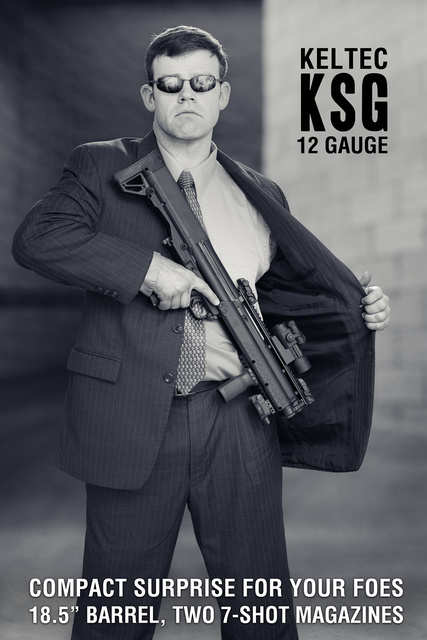 In his comment, he pointed out that when the KSG was announced at the 2011 SHOT show, it’s target release date was in Q4 2011. I’ve followed the news on the KSG pretty closely, and I must admit that I never saw a timeframe announcement. The SHOT announcement / preview page does not make mention of a Q4 release date. If I go and look at the Kel Tec KSG product page, it indicates that the KSG will ship by year end. If that’s the case, then I absolutely accept that Kel Tec is on schedule for the KSG release. Kel Tec is known for innovative products, and I stand by my statement that I will be a purchaser of the KSG. I can’t wait to get my hands on one and try it out. Personally, I think that Kel Tec took the advice of some early testers and re-tooled aspects of the KSG. Kudos to them for that. I’m willing to accept a delay for that. But if your intention was for a near-2012 release date for a product announced, oh, 11 months ago… I never saw that information come across. Don’t get me wrong. I’d love to have his photographic talents. Unfortunately, my mind jumped to the conclusion that Oleg was part of a product reveal. I fear that the real surprise will be *if* Kel Tec ever ships this gun. It’s been announced since, oh… January. That’s enough time to get pregnant, have the baby, and have enough photos of the little munchkin to bore all of your co-workers to death. Posted in DBM. Tagged with Guns. Thanks to Accurate Shooter’s Daily Bulletin for this. Many people – politicians and otherwise – believe that the state knows best about how you should defend your family. This video shows the real outcome of that type of thinking. Screw that. The right to personal protection is a God-given right. Posted in DBM. Tagged with Guns, politics, Self Defense, Video.